Research news from ASTRO focuses on developments in managing the most common cancer in men. November’s American Society for Radiation Oncology (ASTRO) annual meeting covered cancer from head to toe as far as research and physiology. Presentations provided valuable new information about treatment and outcomes related to lymphoma; breast, lung, bladder, and colorectal cancers. But a major focus of the most recent ASTRO meeting involved prostate cancer, a common male problem that can often prove to be a manageable disease. Prostate cancer is often curable, as long as the disease is detected within the treatment window: 98% of patients survive at least five years beyond the initial diagnosis, according to ASTRO. But the prostate cancer issue has fostered debate related to both screening and subsequent treatment, with the topic of one important presentation related to screening. The wide application of routine prostate cancer screening began in 1993 with the use of the prostate specific antigen (PSA) test, which led to earlier diagnosis. The value of the PSA test remains a topic of debate. Researchers involved with the recent retrospective study, detailed in “The Impact of Screening for Prostate Cancer on the Development of Metastatic Disease After Treatment,” believed the best way to measure screening effectiveness was to examine its ability to decrease metastatic prostate cancer within 10 years of treatment for a screened population. Researchers divided patients into two groups: those treated in a prescreening era (1986 to 1992) and those treated in a postscreening era (1993 to 1996). Patients were classified as having high-, intermediate-, or low-risk disease to determine which groups could potentially benefit from prostate cancer screening. The study revealed that within each of these three risk groups, patients treated in the prescreening era were significantly more likely to develop metastatic disease within 10 years of treatment compared with men in the postscreening era. “We feel this demonstrates that screening is important to catching cancer before it spreads beyond the prostate and becomes incurable,” says Reddy. She concedes that the study results provide only the initial footprint in a forward direction. “A larger study now needs to be done to support our findings,” she says. Two other studies looked at radiation therapy as it is applied to prostate cancer treatment. The first compared intensity-modulated radiation therapy (IMRT) with 3D conformal radiotherapy (3D-CRT) in terms of side effects. Researchers found that patients treated with IMRT experienced fewer gastrointestinal complications compared with patients treated with CRT. The study demonstrates that IMRT accomplishes what it was designed to do: reduce bowel complications compared with conformal radiation, says Bekelman. “Hopefully, our study leads to further similar studies. We now need to look at proton therapy vs. IMRT, brachytherapy vs. CRT or IMRT, and prostatectomy vs. radiation therapy. We hope our study fosters further research in these directions,” he says. Another significant radiotherapy-related study presented at ASTRO involved the addition of radiation therapy to hormone therapy to increase prostate cancer patients’ survival chances. The study, “Intergroup Randomized Phase 3 Study of Androgen Deprivation Therapy [ADT] + Radiation Therapy [RT] In Locally Advanced Prostate Cancer [CaP],” showed that patients treated with combination hormone and radiation therapies demonstrated longer survival compared with patients who received only hormone therapy. Currently, the number of men treated with this combination is on the rise, but many patients are still treated with hormone therapy alone. These interim results come from the largest randomized trial of its kind. The multicenter study involved the National Cancer Institute of Canada, the United Kingdom Medical Research Council, and the Southwest Oncology Group in the United States. Specifically, researchers examined the effects of external beam radiation treatment added to lifelong androgen deprivation therapy for patients at a high risk of cancer return after treatment. Androgen deprivation therapy lowers the level of male hormones androgens, which shrinks the prostate or slows down prostate cancer growth. During a 10-year period from 1995 to 2005, 1,205 high-risk prostate cancer patients in the United States, the United Kingdom, and Canada were randomly selected to receive hormone therapy alone or a combination of hormone therapy and radiation treatment. They were followed for six months on average. Interim results revealed that the addition of radiation therapy significantly decreased the risk of death. Further, there were no increased long-term side effects. If the interim analysis figures are similar to those of the final analysis, the impact could be significant, according to lead author Malcolm Mason, MD, a radiation oncologist at Cardiff University in Wales. Clinicians could witness a 43% reduction in the chance of death, he points out, and this would involve thousands of men throughout the world. Mason comments that the study results point to paradigm-shifting implications: Standard treatment should include a combination of hormone and radiation therapies. Another highlighted prostate cancer study indicated that afflicted men who take aspirin for its anticoagulant benefit in addition to radiotherapy or surgery see their death risk reduced by at least 50%. This large study, “Aspirin Use and the Risk of Prostate Cancer Death in Men Treated With Prostatectomy or Radiotherapy: Results From the CaPSURE Database,” involved more than 5,000 patients with localized prostate cancer. Researchers evaluated data from the Cancer of the Prostate Strategic Urological Research Endeavor (CaPSURE) database to investigate anticoagulation effects of four medications—aspirin, warfarin, clopidogrel, and enoxaparin—related to risk of prostate cancer death among men whose cancer had not metastasized. The study involved 5,275 men with localized prostate cancer who were treated with surgery or radiation. Of these patients, 1,982 were taking anticoagulants. Results revealed that anticoagulant usage among patients treated with either surgery or radiation reduced the risk of death from 10% to 4% at 10 years. Risk of bone metastasis development was also reduced. Further, study results indicated that the benefit appeared even greater among patients diagnosed with high-risk prostate cancer. Further studies are necessary before the addition of aspirin to prostate cancer therapy becomes standard treatment, Choe says. “That will involve a prospective study instead of going back and looking at the outcomes of previously treated patients. This way, we’ll have better control. One of the downsides of our recent study was the doses or the therapy duration was not part of the trial. So we don’t know the optimal dose or how long to take the medication. But we have revealed the association. Now we need to confirm the association, and that will be best done in a prospective study,” says Choe, who will be part of the next step. Other ASTRO presentations provided equally important information. For instance, a study conducted by researchers with the Early Breast Cancer Trialists’ Collaborative Group found that using radiation therapy after lumpectomy reduces the risk of breast cancer recurrence by 15% over 10 years and reduces the risk of dying by 4% over 15 years. The study, “Effect of Radiotherapy [RT] After Breast-Conserving Surgery [BCS] on 10-Year Recurrence and 15-Year Mortality in Women With Early Breast Cancer,” involved the records of nearly 11,000 women in 17 randomized trials related to radiation therapy after breast-conserving surgery. The trials were carried out in the United States, Canada, and Europe and were initiated between 1976 and 1999. The studies confirmed that after a lumpectomy, radiation therapy reduces the risk of breast cancer return and death, according to lead author Sarah Darby, PhD, a professor of medical statistics at the Clinical Trial Service Unit and Epidemiological Studies Unit at Oxford University. • Radiation therapy and MS: Stereotactic radiation is an effective long-term treatment for trigeminal neuralgia, a painful condition that occurs with increased frequency in patients with MS, a progressive neurological disease affecting about 300,000 Americans. 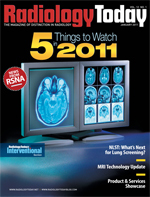 Tejan Diwanji, a doctoral candidate at the University of Maryland School of Medicine and lead author of the study, “Long-Term Outcome of Gamma Knife Stereotactic Radiosurgery for Multiple Sclerosis Associated Trigeminal Neuralgia,” reports that researchers studied patients for a median of five years after treatment—the longest follow-up period ever completed. Radiosurgery performed with the Gamma Knife is a proven alternative to surgery or antiepileptic drugs, Diwanji adds about the study designed to determine the long-term effectiveness of treating trigeminal neuralgia in MS patients with Gamma Knife radiosurgery. The study involved 13 MS patients with trigeminal neuralgia who were treated with radiosurgery at the University of Maryland between 1998 and 2001. More long-term studies could confirm the positive and lasting outcomes of radiosurgery, making it a treatment of choice for MS patients afflicted with trigeminal neuralgia, Diwanji reports. • Hodgkin’s lymphoma: A lower radiation dose used to reduce side effects is not as effective as the regular dose when given with the standard chemotherapy in the treatment of Hodgkin’s lymphoma patients with early intermediate-stage disease, according to a unique randomized study. In addition, the trial showed that a more intensive chemotherapy is not more effective than the standard chemotherapy treatment for patients. Hans Theodor Eich, MD, PhD, a radiation oncologist and associated professor at the University of Cologne in Germany and lead author of the study “Intensified Chemotherapy and Dose-Reduced Involved Field Radiotherapy in Patients With Early Unfavorable Hodgkin Lymphoma: Final Analysis of the German Hodgkin Study Group [GHSG] Randomized HD11 Trial,” reports that before the study, the optimal chemotherapy regimen and the most effective dose of radiation was unclear. • Bladder cancer: Chemotherapy plus radiation prevents bladder cancer recurrences, according to the multicenter, randomized study “Results of a 2x2 Phase III Randomized Trial of Synchronous Chemo-Radiotherapy [CRT] Compared to Radiotherapy [RT] Alone and Standard Versus Reduced High Volume RT in Muscle Invasive Bladder Cancer,” which was supported and coordinated by Cancer Research U.K. Adding chemotherapy to radiation therapy for muscle invasive bladder cancer frees 67% of patients from bladder disease two years after treatment, according to study leader Nicholas James, MD, an oncologist and professor of clinical oncology at the University of Birmingham in England. From August 2001 to April 2008, 458 invasive bladder cancer patients entered the trial. Results of the study showed that the combination of chemotherapy and radiation treatment reduced the long-term risk of recurrence of cancer within the bladder while preserving bladder function. • Colorectal cancer: Researchers in Europe found that radiation before surgery keeps colorectal cancer from returning. Specifically, patients with cancer residing at the end of the large intestine who receive one week of radiation therapy before surgery had a 50% reduction in the chance that their cancer would return after 10 years. Corrie Marijnen, MD, a radiation oncologist at the Leiden University Medical Center in the Netherlands, led the study and comments that this short course of radiation opens new windows of opportunity for rectal cancer treatment. • Lung cancer: A study conducted in Japan reports that stereotactic radiation is as effective as surgery for treating operable early-stage non–small-cell lung cancer patients and presents a noninvasive alternative to surgery with less negative side effects. Yasushi Nagata, MD, a professor and radiation oncologist at Hiroshima University and lead author of the study “A Phase II Trial of Stereotactic Body Radiation Therapy for Operable T1N0M0 Non-Small Cell Lung Cancer,” reports confirmation that stereotactic body radiation therapy is an effective treatment alternative for aged patients with early non–small-cell lung cancer. In the future, it’s possible that radiation will be a substitute for surgery in many patients.